I do believe that the sweetie man mistook mustard greens for kale, so these are actually mustard green chips. Truthfully, I made these just to have the oven on. I think I'm too lazy to make them on the regular. Maybe once a week, but more than that would get old real quick. On the other hand, I could do worse than eat a pound of kale once a week. I make mine pretty plain, just olive oil and salt. But you can get fancy with them, Z sprinkles her chips with sesame seeds before putting them in the oven and Box did some with honey and tamari and sesame oil and sesame seeds. If you come up with something good, you can get at me at allapoppy (at) gmail (dot) com. Heat oven to 325 degrees. 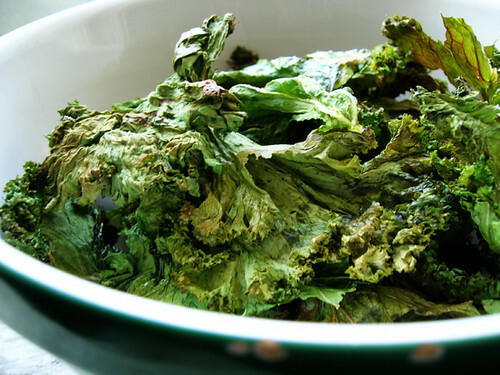 Wash, stem, and tear kale into about palm-sized pieces. Drizzle with a tiny bit of olive oil, like less than half a teaspoon. Then sprinkle with a teeny bit of salt, less than a pinch. Toss and spread on a cookie sheet in a single layer. Put them in the oven for five minutes. Take them out and turn them over with your fingers, then put them back in the oven for five more minutes.